If you follow our adventures on social media, or have watched this weeks Road Talk episode, then you know it's been one crazy week on the road! There we were, driving happily down the highway, when we hear something, feel a jolt, and I look into the side mirror just in time to see something shatter all over the highway... bye, wheel cover! Our tire blew, so we quickly pulled over and set to work fixing it. The only issue was that the jack that came with the truck was not really made to lift up a camper. It worked fine, sure, it just took FOREVER! 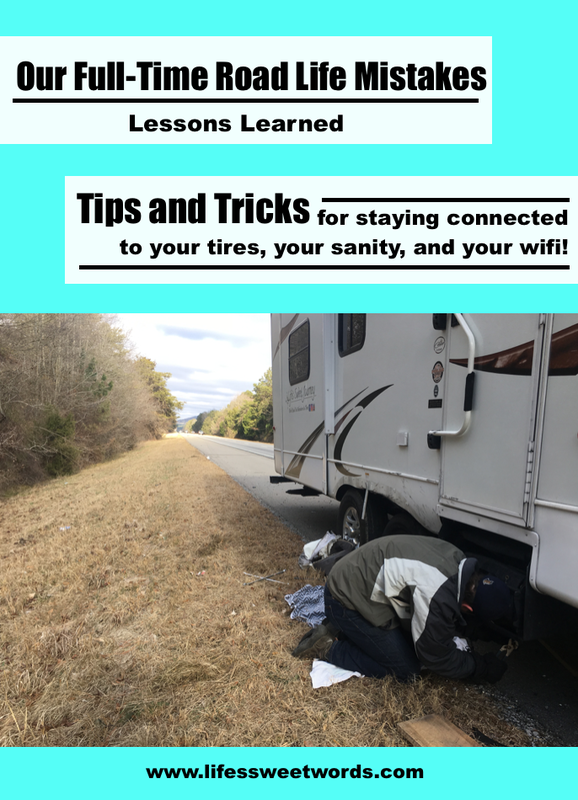 Make sure, when you buy an RV, you invest in a good jack to pump that baby up, so that you don't spend over an hour on the side of the road trying to change out a tire. We went out the very next day and grabbed a better jack! We should have known this one! The ground looked wet, we knew we weighed a whole heck of a lot, yet Babe figured that with the 4W Drive we would be fine. We weren't! Sure, it "looks" so much easier to just cut across a small stretch of field than it does to try to turn your big beast of a camper around on a narrow road. It's not! It's really not! If someone needs to get out of the car to direct and it takes 10 minutes to get it turned around, that's ok. I beats 3 hours in the dirt and being the talk of a tiny town, after everyone and their brother stops to try to help (thank you to all the kind strangers! ), before everyone finally gives in a you call a wrecker service. When you are mapping out your stay you definitely need to call parks if you are needing to ensure they have good cell service. We picked the park we were heading too, because we get a good deal on stays and the website said they had wifi. They did have wifi; the only issue was it didn't actually reach the campsites. The only place you could access the wifi was the clubhouse. It worked for one night; we just loaded all our teaching supplies and taught from there. Thankfully the doors never locked, because it said the clubhouse wasn't meant to open until 8am, but we had to be setup and ready to teach be 5am. If working online is part of your livelihood, you simply can't rely on the parks wifi. Sometimes it works great, but other times- even with full bars- you can barely access a website. The busier the park the slower it runs, because everyone is trying to use it at one time. Therefore, we now call and make sure any park we are staying at has good cell service. That ensures we can teach from our hotspots when the wifi is slow. We do try to use wifi when we can, as our hotspot speed slows after so much usage (we have the Verizon unlimited plan and love it, minus the hotspot slow down), and as long as a park has a strong wifi signal it will work well early in the morning, while everyone else is sleeping. Once the park begins to wake we switch over to our hotspot. To be honest, we were a little worried we had a made a poor investment with this one. We tried two different parks and had to leave because there was no cell signal and the booster wasn't working. It really won't help you if there is literally no signal at all, but the park just 20 minutes down the road from the one we had to leave, had just enough cell service for the booster to finally do what it was made to do! Thank goodness for our WeBoost!! We were so happy when it finally worked that we may have cheered. We have been set up for a week, in the middle of nowhere Tennessee, and have had a perfect signal that has allowed us to teach (classes down through video chat), as well as stream shows and YouTube! Before we got it hooked up at our current park, we had two bars and the Internet speed was super slow. We had enough of a signal to eventually get into our classroom pages, but not enough for it to load our cameras or classroom slides. With the WeBoost on, our classrooms loaded immediately, with camera access and all! It's definitely a must for working on the road! This week has definitely been a learning curve and we are grateful to be fully operational again! Any questions about staying connected or fixing tires on-the-go?! Just ask us, we're pros now-haha! Any mistakes you've made and learned from while traveling?! Would love to hear A LOT more detail about the WiFi box that you use and the booster. Cost, company choices, towers, etc. Thanks! Oh and would love to know more about your teaching and if that's the only work y'all do on the road. Hey, we actually don't use a Wifi box. The hotspot it actually off of our phone. We have Verizon unlimited plan, which is $189 with taxes, etc. for two phones. It has been great! We have always been with Verizon, just because they seem to have the best and most consistent signal, but made the switch to unlimited when we hit the road. The only issue is the hotspot usage is capped at 15GB per phone (which means once we have used the hotspot that much our speed when using the hotspot is slower). Honestly though it really hasn't hurt our teaching abilities. We can still turn on the hotspot (which gives internet to our computers when we don't have wifi) and teach without issue, even at the slower speed. It just makes scrolling FB or watching any shows difficult. We can't really understand why it still connects well for our classes (since those are done through video) and not anything else, but we aren't complaining! We use the WeBoost booster box, which boosts any cell signal in the area. 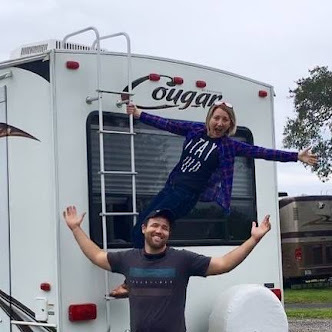 We plan to do a more in-depth post and video on this soon, showing how we hook it up/ how it works etc, but it's basically an extra little antenna thing that we put up on the roof of the RV, which then connects to a box inside the camper that helps us get a stronger cell signal. It really came in handy last week, as we originally had two bars and couldn't access our classes, and then once we plugged into the booster all was well. That was definitely an investment (about $500), but we heard that it was the best one for RVers, so we figured it was worth it. They have smaller units if you are looking for something for home, or aren't planning to be as far out as we knew we would end up being from time-to-time, that cost less. We teach with a company called VIPKID (I wrote a little more in detail about it in this post http://www.lifessweetwords.com/2017/08/vipkid-finding-remote-job-that-allows.html) and for right now it is the only thing that we do on the road. It's one-on-one instruction with school aged kiddos in China, who are wanting to learn English. We wake up and teach early in the mornings and then again on weekend evenings. At some point we would love to do some seasonal work on the road, maybe help do a wine harvest or work at a state park, but for now we can't commit that long to one spot, so this has been keeping us rolling. We do make a small amount from the blog, but nothing that would support us. Working to grow that, but for now teaching is keeping us gassed and going :) Any other questions feel free to ask or shoot me an email (lifessweetwords@gmail.com). Okay the fact that y'all are traveling around in an RV is SO fun! I've never even been in an RV but these seem like some great tips! Wow it sure does sound like your having fun but learning a lot as your go too! Thanks for sharing what your learning with everyone, will save lots of people with these tips. OH wow! You guys had quite the week! We don't have an RV but we have a 13ft vintage Boler trailer and we love traveling around in it! 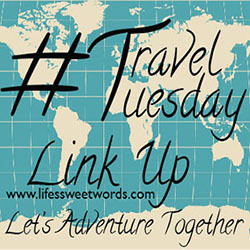 A Travel Blogger Link Up // #TravelTuesday 24!